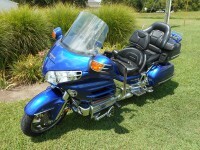 I have been running a Goodyear Assurance triple tread on the back of my '98 Valkyrie for 20K miles now. The tire does get better with miles as the shoulder wears a little rounder. The Tire seats solid as a rock. I have not needed to add air from the 35PSI I have run for 5 years and there is no squirm at speed or on turns. The traction is awesome in wet or dry weather. I also felt the bike was easier in low speed maneuvers where the bike is basicly vertical (the square tire helps it stay that way). If I only did highway miles or drove on good roads, I would have no qualms about running the tire for another 40K-60K miles that it looks like it has left on it. That said, the bike is noticeably less nimble and eager to dive into turns on the twisties. Conversley, it stands up quicker coming out of the turns so going back and forth through linked turns is not much less quick. What is less livable is the way the bike handles dished or broken road surfaces that we have a lot of here in Vermont. The tire goes from one edge to the other and the bikes normally responsive handling makes the it want to veer and steer back and forth instead of just tracking on the line you want it on. You get used to it and just have to ignore it but it is totally unnerving to an inexperienced rider and no fun even for an experienced one. The two other bikes I have and the GL1800 I just picked up with MC tires are all fine and effortless on the same broken pavement but this in very unsettling on my Valk, even after 20K miles. Maybe a less wide and square CT would be much better but I can only comment on what I know and hope it helps you and others out. I have an GL1800 with ABS and Honda only recommends several brands of tires because of how the ABS works. Has any one put a CT on a 1800 with ABS and the ABS still work like it was designed. I've been thinking of going with the CT option ever since I rode my friends 1800. It was different but I didn't feel like it was unsafe but I didn't ride it to far so didn't get to see how it reacted in different situations. If you are one who has done this and are happy with it could you recommend a tire to use, or perhaps tires to avoid. I have a cure for your too tall tire. I researched for a long time, not wanting a big change in gear ratios. I finally went with a Vredestein delivery van tire. Less than $100 including the freight, from Simple Tire. It is the closest size I could find in height, to the stock tire. Lowered RPM by about 200, which you don't even notice, even pulling off from a stop light. It's a 6 ply tire, load rating of 1600 or 1800 lbs, instead of the 900 for a motorcycle tire. I've run it in dry and wet, making sparks in the twisties and love it. If you are like me, you will never go back to a bike tire on the back of a Wing. BTW, when I had a chopper, back in the 60's, all we ran was car tires on the rear of our Harley's, so this isn't something new. I don't understand your problem with mounting. Mine took about 15 minutes with tire irons and some lube. Much, much easier than the motorcycle tires I've been mounting. You save about $150 on the first tire change, then about another $500-750 by not putting another 2 or 3 bike tires on in the future. Win, win in my book. I'll never go back on a heavy bike like the Wing. Just my 2 cents worth. Oh, the Dunlop Elite that came off the rear had 4 oz of weight to balance it. I put 1/4 ounce on the Vredestein. By the way that is a 185/75R16 which leaves plenty of height room for the suspension, but is absolute max width without touching on the sidewalls of my 1998 GL1500SE. Only have 10K on the tire so far, but looks like new with no cupping or abnormal wear. Try that with an Elite. Also, I pull a Mini-Mate behind, too. One item, I think the speed rating is something around 95 or 100, so if you are planning max speeds, might look for another tire. Thought I would add one more tidbit of info. I run the Vredestein at 44lbs. 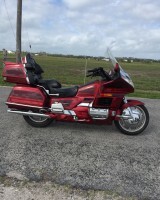 Also, I took the Mini Mate from Tallahassee to Key West, and over to Everglades City from there. On the way across Tamiami Trail, with the Mini Mate in tow, did at stretch at 85mph on the deserted road. No issues at all. Thank you for the feed back on the taxi tire. Looks like I won't be changing over. An inch of additional height would make it too hard to get my leg over the bike. Ok, Strange Tire trial on a bike. Ya, many interesting replies and I can understand why, to a point. If ya do a bit of research or know even the a bit about Motorcycles, Understanding should come to you that Tires on a Car that encounters turns/corners, rely on the base of the tire being in contact with the road/terrain. With Motorcycles (2-wheel vehicle, that lean to a side) require different traction to enable the traction to take place up the SIDES of the tire to an extent to maintain stability for the Motorcycle as it leans around the turn to keep it from sliding out from under the rider! This is not required on a 4-wheel type of vehicle! 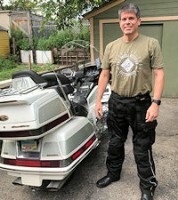 Ok, get your mileage and perhaps take some fun out of becoming "One with the Bike" to gain the full experience (I been riding since age 10, mini-bike start off, dirt-bikes, street-bikes, crotch rockets, now road cruisers. I'm 62 now, Love the leans on good road at fast speed, smooth and a lil power as ya hit the apex then blast it just past the apex of the turn and Adrenaline Rush to the max when I Drop gear, max the throttle for Boost and hit top gear when the RPMS are set! Ok, a Car tire? Yeah perhaps is I didn't wanna experience the nice feel of a lean on winding mountain roads and feel safe if they were wet from a rain. On a Drag-Strip, would probably work best since car tires are designed for the most traction to be on the base of the tire. Enjoy you mileage. Perhaps it works for your driving style. don't knot what wear and tear it my do to the rim (unless you have to pay more for that as well). I prefer, the nice unity with my Ride (car, Horse, BIKE!) and the security with being "One in Tune" with my Ride, being it a Car, Bike, or Animal (Horse, Camel, etc). I mean No Offense by the way. Choose what you wish. I'm only stating my input. Anybody remember the stunt drivers years ago that would hit a ramp and catapult up onto two wheels?? Funny thing, they rode just like a motorcycle, on the edge of the tire. Yes, car tires are “designed” for cars. A spatula is designed for flipping eggs, but works for lots of other foods. A few years back someone took a motorcycle equipped with a motorcycle tire and a motorcycle equipped with a car tire through a curve with some kind of powder on the road. Guess which tire left a wider track and put more rubber on the road??? Yes, it had the big flat part, the part that the car pushes against, up in the air, but still put more rubber on the road. I have yet to find any data showing that a car tire on a motorcycle causes crashes. They have some quirks, but a lot of people like them. There is a small difference in the inner bead, but it’s small and can be shaved off the inner rubber edge. I'll give it a test ride if it ever stops pouring rain, but I think this should have fixed my issues now. I appreciate the reply. While true, it's possible that the riders made some other mods to their vehicle as well. I have to admit, I do like the tread pattern way better for various road conditions than the Dunlop E3s. Pretty scary when ya look at the tread comparision. The Dunlop E3s could about pass for slicks, LOL! I don't know what the difference in the sidewall strength would be though. Perhaps more on a car tire to support more weight (yet there a four tires on the car, but when the car corners at high speed or slides, puts a bit of stress on the sidewall)? I do admit that I've had better tread patterns on bike tires for various conditions on the road other than the Dunlop E3s (I'm not referring to "Knobbies either, lol). I'm sure we've all seen better tread patterns on other types of Bike tires than the Dunlop E3s. With the Photos posted by everyone, you've definitely got my interest up! Thanks. First impressions: not much different than my Avon Venom. 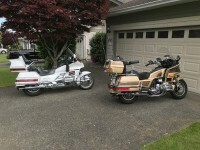 Mine is on a 77 Goldwing with lots of mods of course. It is smaller so taking off is easier. Making a quick stop seemed much faster. Braking should be better unless in a turn. Taking off, I can still spin the back tire and it makes more squealing noise than the Avon. It tends to move left. Turns take a little more push pull, but doesn’t seem too bad. In ruts is where you notice it. We gave about 18” wide waves in the road here where everyone travels. It does feel squirrelly there. I’m at 38psi for now. My bike is much lighter than a 1500 so I might try a few psi less. All aired up on a 1500 rim it’s a shade over 7” wide. When it can it measured 8” which would be too much. I may sipe the outer edges some. With the bike leaned over to the pegs, there isn’t much rubber on the pavement. My guess is about the same as the Venom. I no longer feel the "weirdness" in turns that I felt at first, where it resists turn-in, and then wants to keep turning more. Either the tire has worn the very edge off, or more likely, I've just gotten used to it. I also no longer have the fender rubbing issue. I did hear ONE fender rub yesterday, when I was hard into a right hand turn on a twisty backroad, and while in the turn, hit a big bump. With the sideways pressure on the swingarm from the bump plus with the suspension moving to absorbing the impact, I heard a very brief rub, but that's all. Slow speed riding is unchanged, if not a bit more stable. Ditto for gravel and grass - it rides just the way it did before, although it feels a bit more solidly planted on both. I tried slow-speed narrow-radius turns (leaning over at slow speed, to the point of dragging footpegs), and it is easily controllable with no worrisome characteristics. I have ridden a fair bit of freeway, and do not find the "following" of lines ground into the pavement that some have reported. The tire feels "softer" in terms of impact absorption, compared to the Avon Venom that I had on it before. It does step a bit up and down off edges of roadway on the freeway, but I was both expecting it and not worrying about it, so not a big issue. The two things I have noticed: at speed, it does feel a bit more "wiggly" in the lateral dimension. Not unseated wiggly, but just a bit more movement laterally in the back end than I am used to. I am 100% sure this is due to the large, blocky tread that is fairly thick, and does not have the lateral stability that the relatively thin almost tread-less characteristic of a typical motorcycle tire. The second is that it feels more squirrely at speed when riding over slippery things like freshly-painted lines on the road or fresh tar snakes. Again, not in a way that makes me not trust it or worry about it, just a bit more movement than I had originally expected. Now that I expect it, it's a non-event. I tried some panic stops but was unable to get the rear wheel to lock up. This is interesting - I have always been able to lock up my rear wheel when practicing a panic stop. This wheel seems to have too much traction to allow that. I suspect that I need to have much more speed in order to get it to lock up - and I'm not really sure I want to "practice" using the speeds involved required to do that - or that I could get up to that speed safely in the parking lot in which I do this type of practice. Other than that, I'm quite happy with it! With the unbiased reviews from you and others here, I am on the other side of the old proverbial fence. When the time comes, I will be going dark. Still have a lot of miles left on my G3. While riding yesterday I was noticing my bike does not follow any snakes or grooves at speeds from 60 mph to 75 mph with the G3s so it will be interesting to see what it does with a CT. I'm considering going dark as well. It will require a bit of adaptation, but apparently it might last for long! My neighbour has it on his truck, very long mileage! 2 Austones down, another to soon go on...in about 5k miles. I get about 80,000 miles from them. I do repack the splines around 40k. While back someone wrote, when in turns the Austone wanted the bike upright ASAP, couldn't get it off fast enough. WELL past few weeks I've been testing that post, its NOT trying to upright itself. He thought it did then made the assumption it was. So in left & right sweepers I set the throttle lock & let go of the bars. Bike stayed true to where I set it. I even swayed my weight to steer proving the "tree" wasn't holding it. As for Austones turning footprint. Find a water puddle, ride through it straight & turning then look at the watermarks it leaves. You'll be suprised at the results, use a tape measure. By myself I'll run the Wing upto 115 - 120 mph., I don't feel any swing/sway/tire-rising around 85. I tested many pressures & the psi is set at 48. One agreement is the offset pavement, it will toss the bike, but you get used to it. Always adjustments to be had on switching tires. RPM's & acceleration. Yup, slightly slower from stand-stills but once underway, unnoticeable. Trailer pulling. I hauled 3/4 ton a few times, sure 1st gear is slower pickup, but again once underway, unnoticeable...well, except for that ADDITIONAL ton behind you. YES, I HAVE TRAILER BRAKES. OH!!! The clutch is still original to the bike and nearing 1/4 million miles. I heard rumors the Austone is going to be discontinued for US shipments, there's no UK taxi's in the US. LIKE I SAID, IT WAS A RUMOR. I'M STILL RESEARCHING THAT ONE. "Mine is a Nokian 195/55 light truck tire." Where did you buy your Nokian 195/55R16? I have always been a Shinko fan because they last a long time for me, and I've been known to drag pegs occasionally, but I'm considering the Nokian because I really don't like changing tires. And did you get the winter tire or the all season? 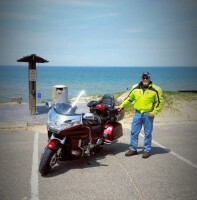 Having already changed 1 final drive at 100K I didn;t want to do another one - the bike had 161K on it when I sold it. Squirrley feel for my experience was an indicator of low pressure - you may want to add a few lbs and try it again. it DOES work - but I wonder about the false economy . But the feel was different and I never got used to it. Very interesting thread. I'll be watching to see how the test is going. Good luck. I hope to hear all about it at the gathering. I've got quite a number of miles on it this summer, and have only good things to say about it. It was strange feeling for the first 100 miles or so, then I stopped noticing it. If I think about it when I ride up or down over a stepped piece of pavement (i.e. where they have scraped away part of the pavement to resurface, and you ride up along the edge of it), the tire kind of "jumps" up or down rather abruptly, and the first few times that happens it kind of gets your attention. But now I'm used to it and I don't even notice it. What I do notice continually is the astounding traction. Wet, dry, dirt, gravel, it doesn't seem to matter, that tire just grabs and goes, with no sliding. In fact, I was out riding my wife's PC800 yesterday (a 2 hour test ride after doing some work on it), and I took it on a closed road that had me on a little bit of dirt. The back end gave a little slip sideways in the dirt and it made my heart jump - I hadn't realized how used I have gotten to the Austone, which would NEVER have done that. At the GoldwingDocs Gathering this year, someone commented that he was surprised how I was still able to carve turns on the tire. If anything, the curves are improved, because I am no longer dragging things as early, thanks to the slightly increased ride height. The grip is very solid, and it gives you confidence in the twisties. I have had one panic stop on it when someone pulled out in front of me in an intersection. A lot of the time during a hard stop like that I will be hard on both brakes and the rear wheel will lock up as the suspension is unloaded. I did not experience this with the Austone, it continued to grip. I haven't tried to intentionally lock it up (very hard to do with the linked brakes), but I've put an awful lot of braking force on it without it skidding. Thanks for the update. Glad to hear that the Austone is giving good service and quality of ride. When I had the CT on my ex-1800 my HD friends were also surprised at how well the 1800 would corner and how much it would go over and not touch any parts. As you mention, a CT does do well in the corners. Going to ride on the Elite 3 tires on my 1500 until next spring, then new tires. Pick up the Austone when I go to Ontario in November. Toss up between the Elite 4 and Michelin Commander II for the front. Is it just me, or have MC tires come down in price? If so, can that be attributed to competition from CTs?